Events, Game Parameters and User Metrics can all have Categorization Tags assigned to them to make it easier to find when using various tools on the deltaDNA platform. 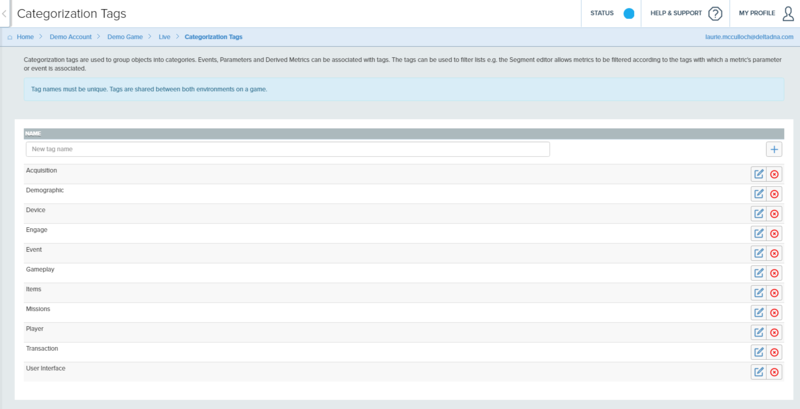 A default set of 11 TAGS are added to each game and many of the standard events and parameters are assigned to Tags by default, but you can Create, Edit and Delete Tags. You can then assign Tags to Events and Game Parameters in their respective editors.